Identity is a direct, schematic image imbued with ideology, and bears a close relationship to Shahn’s work as an illustrator and poster designer. This late work has been linked to the student protests of 1968 and the artist’s opposition to the Vietnam War, as well as to the sensation of the futility of effort, which invaded him during his final years. The simplified, symbolic composition, which is aesthetically close to poster art, is a frieze of the arms of five people, exaggeratedly elongated and thin, with their raised hands interlinked. Above them is a Hebrew text from the Talmud — “If I do not care for myself, who will care for me? and if I care only for myself, what am I? and if not now, when?” — with which the artist may have wished to express the two clashing thoughts of Judaism: the insignificance of the individual, on the one hand, and his unique value, on the other. 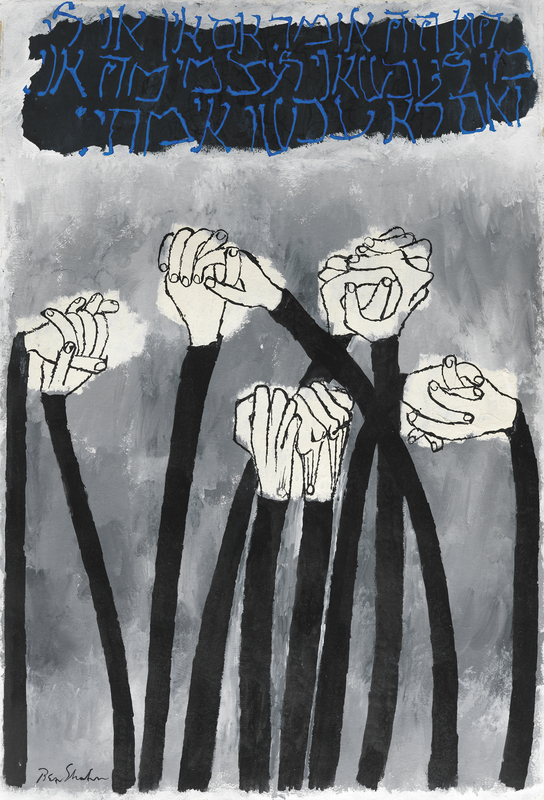 The image of the raised arms — a characteristic, expressive gesture of collective protest — had appeared frequently in Shahn’s compositions, such as French Workers, also belonging to the Collection. These images are drawn from the symbology of Marxism and are intended to exalt and dignify manual work though the hard working hands that are raised to clamour for justice and freedom.